Rotary actuator RTB-8U is an economical and versatile rotary stage used as a filter wheel, polarized optic rotator, flipper mount or basic rotation platform. 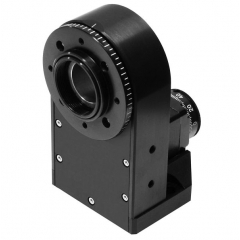 It features M27x1 threaded aperture for 1" optics, retaining ring and internal reference surface for 25.4 mm optics. Tooling plate attachment available with an array of tapped holes.